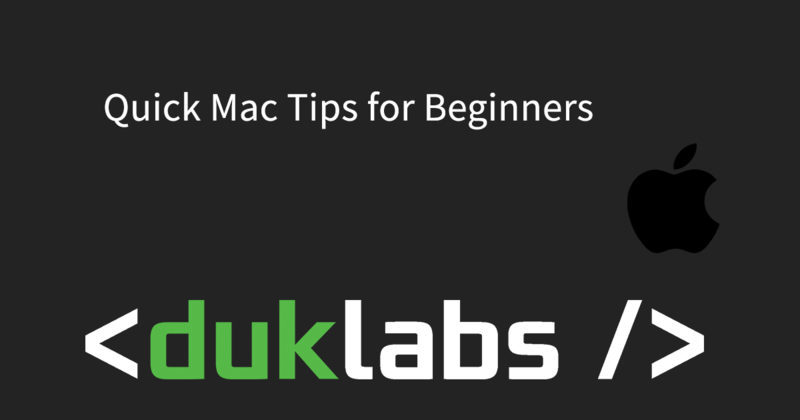 Here’s a quick collection of tips I put together on common questions I get with new Mac Users! The MacBook Trackpad lets you use multiple fingers to do things like scrolling and right clicking very easily! To Scroll, just brush two fingers together up and down. To Right Click, press down with 2 fingers. These options can all be changed in System Preferences under Trackpad. You can just close the lid on your laptop to put it to sleep. When it’s asleep it’ll use a lot less battery (approx 5-10% or so per day) and be ready to use as soon as you open the lid. If you want to take a picture of anything on your screen, you can press Command + Shift + 3 to take a picture of the whole screen. This is really useful to take a note of an error message. This will put an image file of what was on your screen on the desktop. You can use the Notes App on your Mac to store passwords and lock them with a master password. To do this, open the Notes app from your Applications Folder, create a new note and then right click on it and go to “Lock this Note”. Then enter a password. Note! If you forget your password, there’s no way to reset it or unlock the note. Bonus points: If you’ve got iCloud set up, it will automatically sync it between your iPhone, iPad and computer! Also note: This isn’t super ideal or recommended, however it is a very simple and easy way to get set up with a semi-secure way to store passwords (and sure beats pieces of paper you can easily lose). If you want to get a little more advanced, check out a dedicated password manager program (I reccommend 1Password). If you’d like a printable version of this article, click here.